Chickpeas and kale become unctuous comfort food when you crisp everything up in brown butter and serve it on top of creamy polenta. This is vegetarian comfort food at its finest. Bring the water to a boil. Whisk in the polenta and salt. Cover and turn heat as low as it will go. Let cook, undisturbed for ten minutes. Then whisk thoroughly for 30 seconds (breaking up any lumps). Cover again and cook for another 20 minutes. Uncover and whisk in the cream cheese until completely melted. Season to taste with additional salt if necessary. While the polenta cooks. drain your chickpeas on a few layers of paper towel and set aside. Melt the butter in a large skillet set over medium heat. Once it begins to bubble up furiously, swirl the pan frequently to keep it moving. Keep an eye on it until you notice the butter solids drop to the bottom of the pan and begin to take on a nutty, brown color. Once this happens move pan off of the heat. Take out 2 tablespoons of the brown butter and set aside in a small bowl. In the remaining brown butter, add chickpeas and kosher salt. Cook chickpeas for ten minutes over medium-high heat, tossing occasionally, until they turn golden brown and start to crisp up. Add the paprika, chili powder, garlic powder, cumin, and cayenne. Toss to combine and cook for one minute. Transfer chickpeas to a plate and set aside. Add 1 tablespoon of reserved brown butter to the skillet and saute kale until wilted – about 5 minutes. Drizzle in red wine vinegar and cook for one more minute. 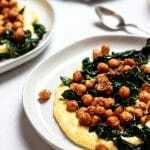 Serve chickpeas and kale over a bed of polenta and drizzle each serving with some of your remaining brown butter. Polenta is really more about ratios than measurements. If you want to make more or less polenta just remember that you’ll need 4 parts liquid to every 1 part polenta. The polenta will continue to thicken as it sits. If you need to loosen it up just add a couple tablespoons of water and whisk over low heat until smooth. Feel free to substitute spinach, chard or any other dark, leafy green for kale here.